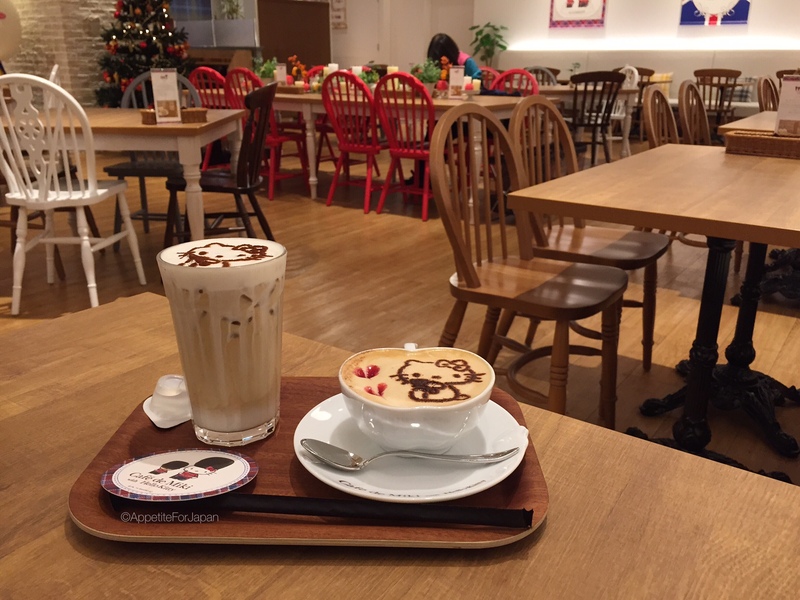 We found Café de Miki with Hello Kitty during a recent trip to Odaiba, when we were actually looking for Hello Kitty’s Kawaii Paradise. 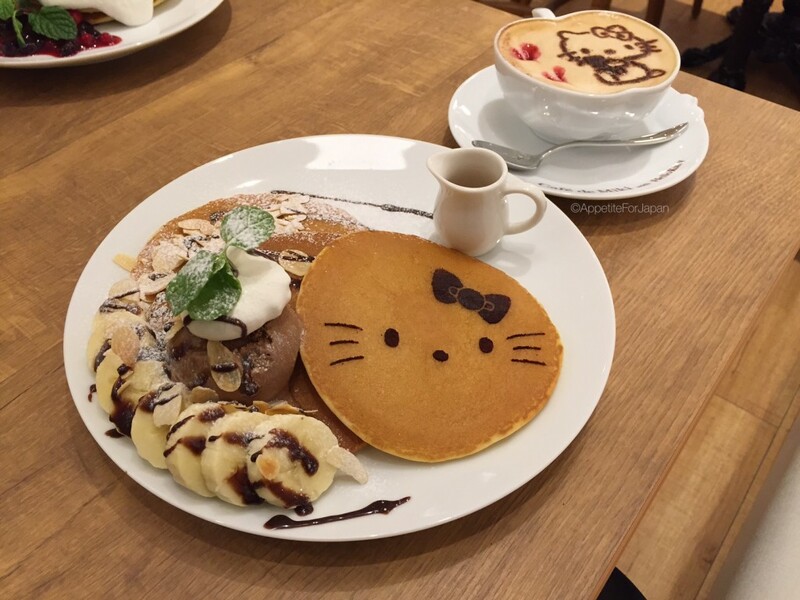 We had visited the small, indoor Hello Kitty theme park a couple of years earlier and wanted to stop by Hello Kitty’s Pancake Party (a cafe within Hello Kitty’s Kawaii Paradise) for breakfast. This was actually at Venus Fort, another shopping centre in Odaiba, but when we couldn’t find it there, we checked Diver City in case we’d been mistaken. 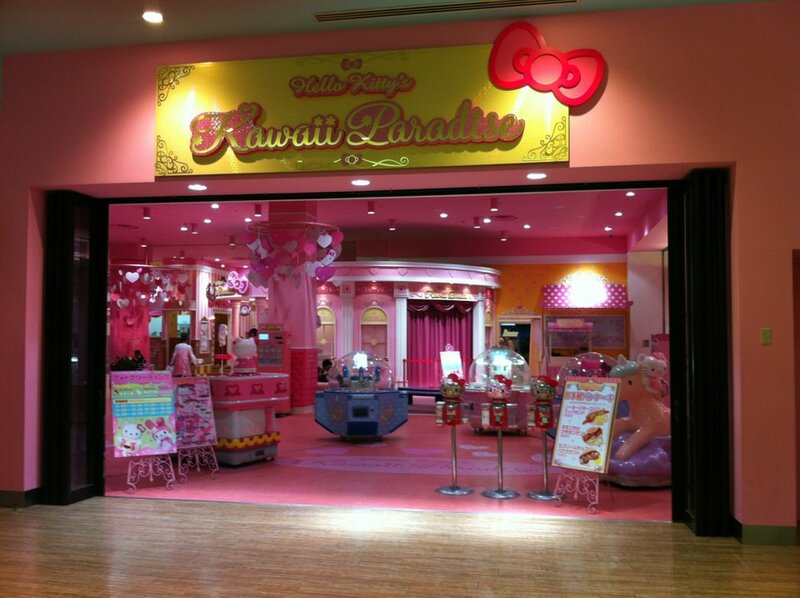 It turns out that Hello Kitty’s Kawaii Paradise – and thus also Hello Kitty’s Pancake Party – had closed in early 2015, and we stumbled upon Café de Miki with Hello Kitty instead. Legend has it that Hello Kitty (ハロー・キティ) is English and was born in a suburb near London. 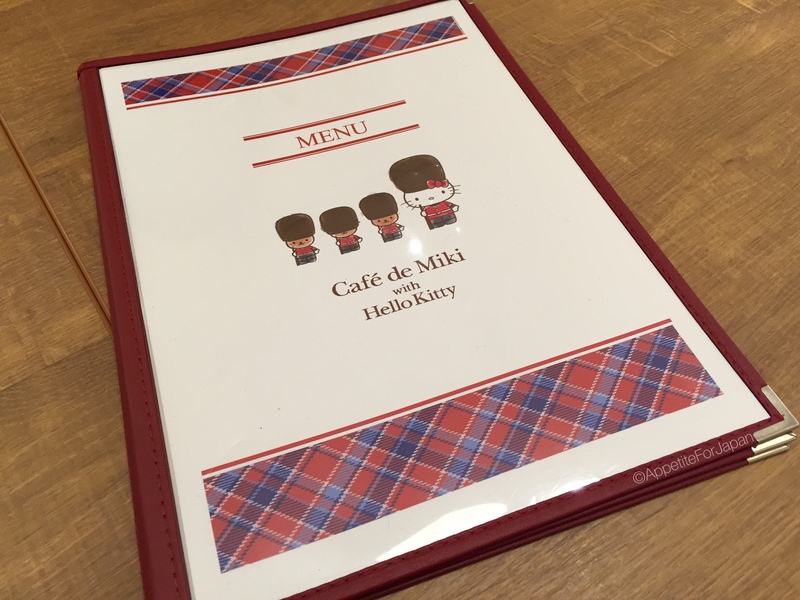 This explains the English colours and pictures of British soldiers, and the presence of scones on the menu – the cafe is meant to be inspired by London (and Hello Kitty, needless to say!). 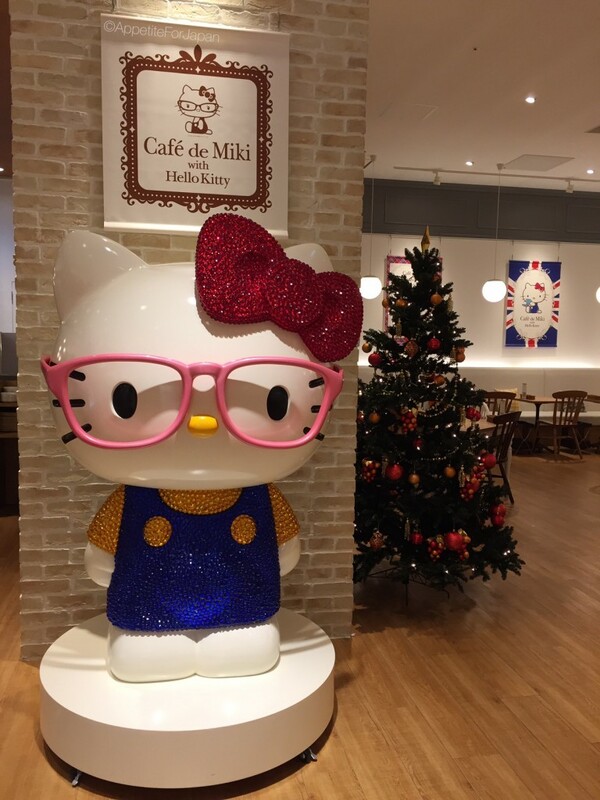 Toward the front of Café de Miki with Hello Kitty is a large statue of Hello Kitty. Customers are welcome to take photos with her. Taking photos in general seemed perfectly acceptable at the cafe, which is a nice change from some themed eateries which don’t allow many photo opportunities. We arrived late on a Thursday morning, and there was only one other person there (another couple of people arrived soon before we left). Diver City, like Odaiba in general, is much less busy than a lot of other parts of Tokyo. The menu features only sweet dishes. These include four types of pancakes, two parfaits, three cake plates, three types of scones, along with drinks such as lattes, hot chocolate, tea and juice. We each ordered a drink – a hot and cold version of the caramel latte – and we each chose a different type of pancake. Iced caramel latte and hot caramel latte (cappuccino? ), each 550 Yen. 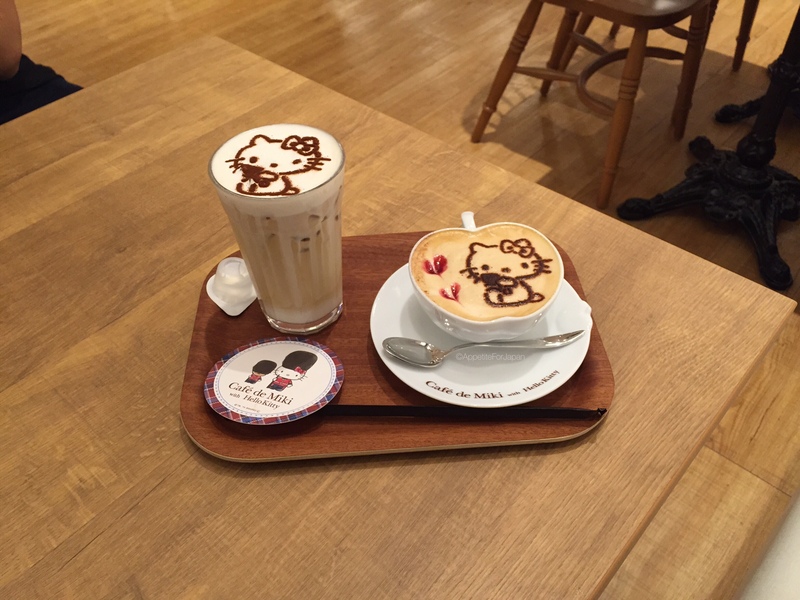 Each latte came with cute Hello Kitty art on the froth, and the iced latte came with a Café de Miki with Hello Kitty coaster. Like many themed cafes, the coaster was presented separately to the drink so that it could be taken home unused. Fluffy cream of strawberry ribbon pancakes 1,000 Yen. The cream ribbon pancakes were delicious. I would go as far as saying that these were the nicest pancakes I have ever had at any cafe/restaurant ever. If I were to go back, I would definitely order these again (and I hope that I do get the opportunity to eat there again!). 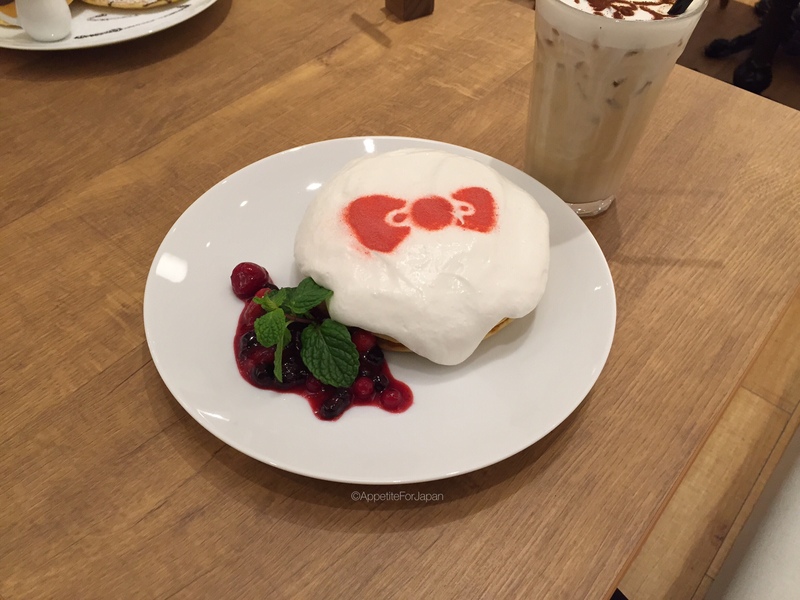 The cream ribbon pancakes are a small stack covered in sweetened whipped cream, with a Hello Kitty bow design on top, and mixed berries in syrup on the side. A few treats can be purchased for take-away. There were not many available when we visited. 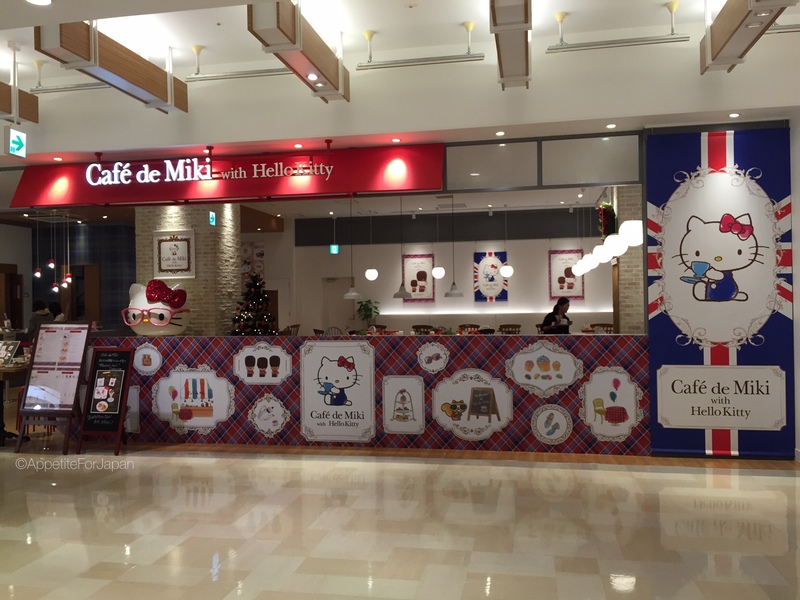 As expected, there is also a range of Café de Miki with Hello Kitty merchandise available. These include sunglasses, travel accessories and tea cups. 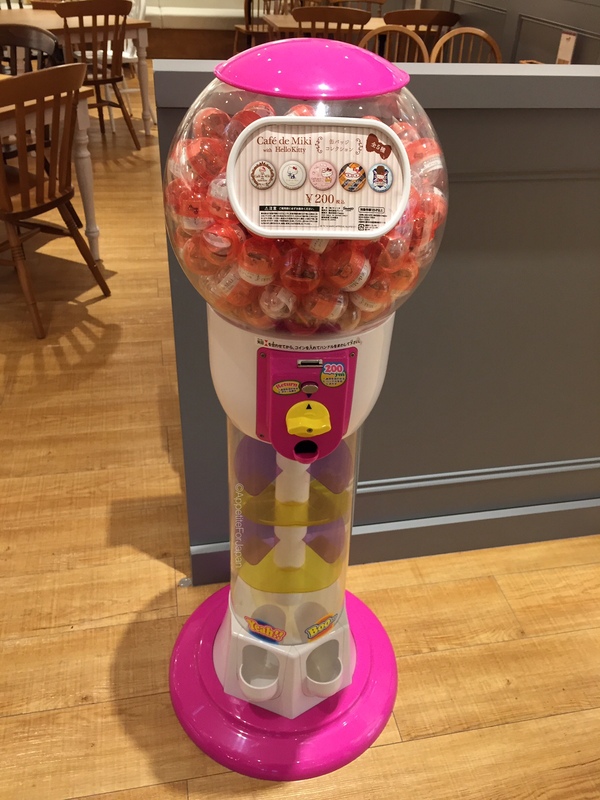 Last but not least, there is, of course, a Café de Miki with Hello Kitty gachapon (capsule machine). 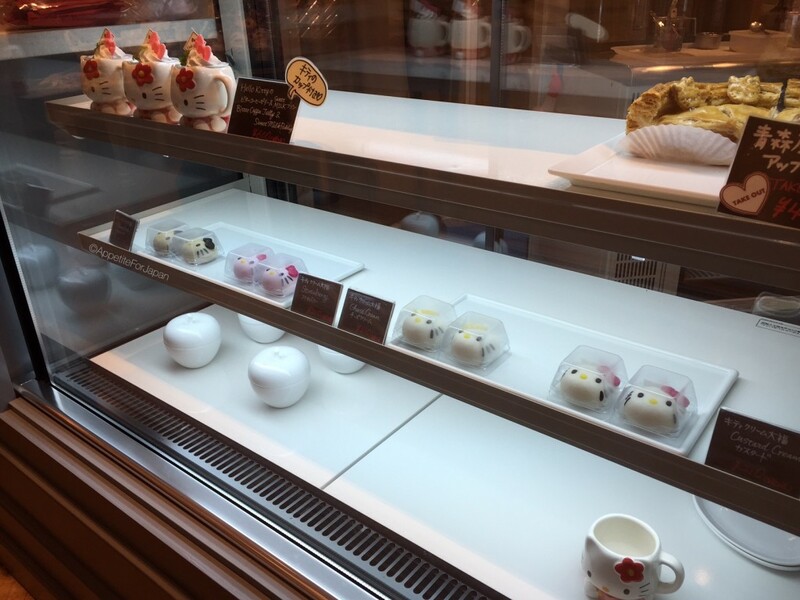 It sells five different Café de Miki with Hello Kitty badges/pins. I gave it a go and got the one on the right – Hello Kitty dressed as a British soldier. 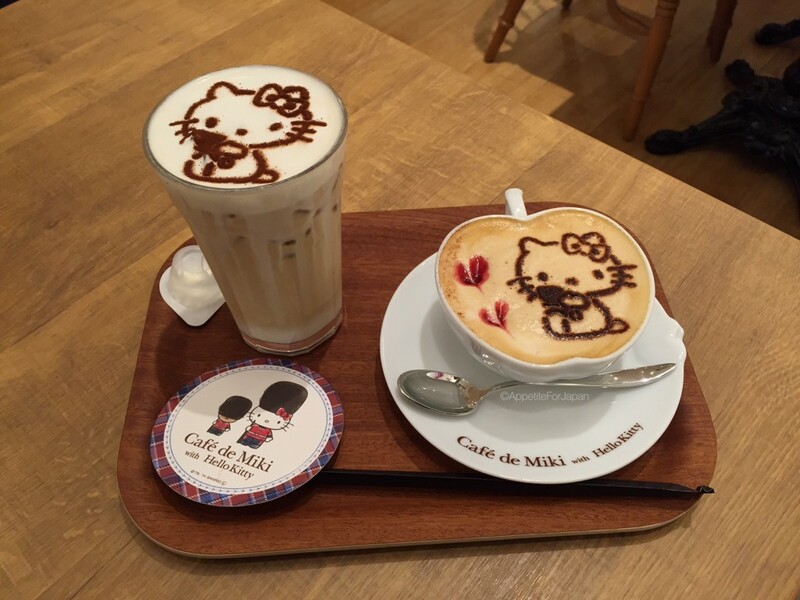 Would I recommend Café de Miki with Hello Kitty? 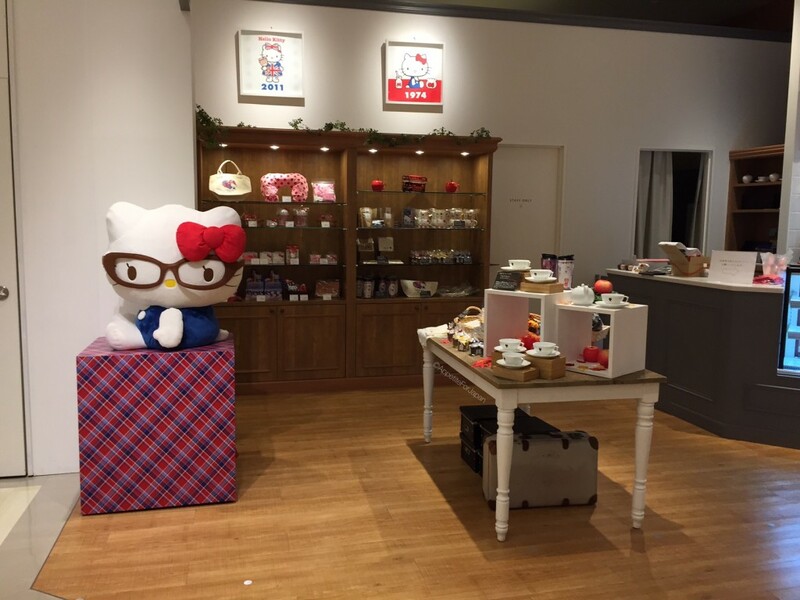 I would definitely recommend Café de Miki with Hello Kitty! If you’re into pancakes, Hello Kitty, themed cafes or you’re just hungry and want something sweet, then yes, it’s definitely worth a visit. The prices are reasonable, the pancakes are delicious (I’m really giving those ribbon cream pancakes a rave review, know – they were great! 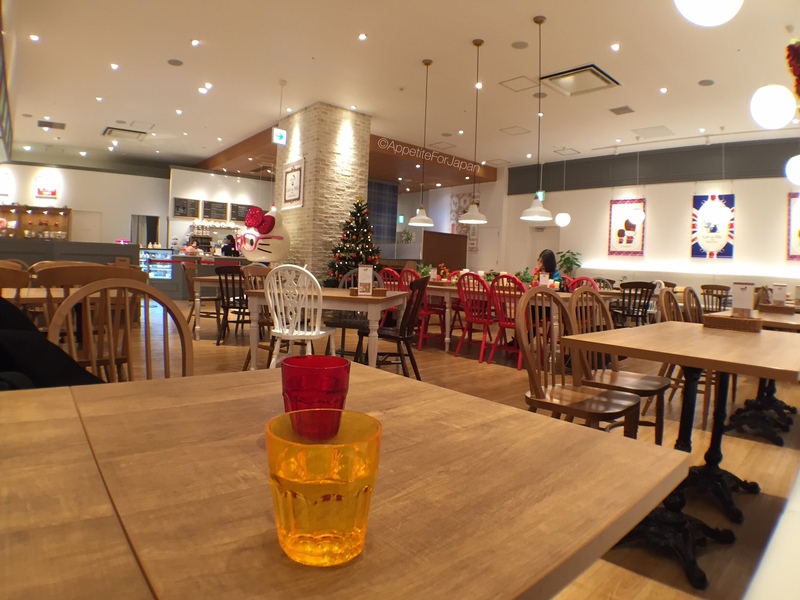 ), there were heaps of tables and hardly any other customers so we could just walk in and choose a seat. The Hello Kitty theme is fairly understated, and – contrary to many themed eateries – I felt like the quality of the food came before the theme, which is quite refreshing. 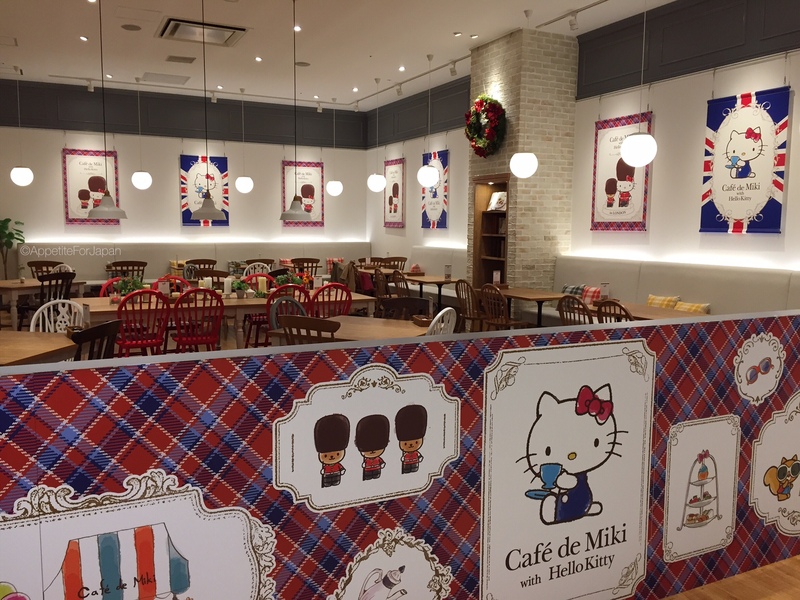 All in all, if you’re planning a visit to Odaiba, definitely consider checking out Café de Miki with Hello Kitty in Diver City. The nearest train station is Tokyo Teleport Station.